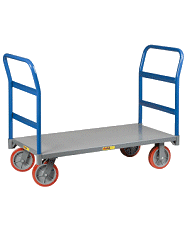 The Vestil All-Terrain Pallet Truck operates like a standard pallet truck, but features large wheels to allow for easy movement on gravel, dirt and other rugged surfaces, indoors or outside. The perfect choice for moving evenly distributed loads at construction sites, nurseries, gravel pits and more. Easy-to-operate 3-position pump handle features Up, Down and Neutral positions – pump to raise, squeeze trigger to lower.Large, easy-rolling pneumatic wheels have sealed bearings for dust protection and outdoor durability.Tight 150° turning radius. 32in.L overall fork length. 3in. to 9in. adjustable fork service height. 64in.W x 50in.L x 51in.H overall size. 50in. usable straddle width between outriggers. Welded tubular steel frame for maximum strength. Durable, high-visibility yellow painted finish with black finish on forks. 2,500-lb. uniform capacity at 12in. horizontal load center/2,000-lb. uniform capacity at 15in. horizontal load center/1,500-lb. uniform capacity at 24in. horizontal load center. Overall Size 50 x 64"
Roller Wheels Front tire: 22 3/8 dia. ; Back steering wheel: 10 dia. Steering Wheel Size Front tire: 22 3/8 dia. ; Back steering wheel: 10 dia.